One of the paramount concerns for airports is perimeter protection; an issue, which was highlighted by a number of recent incidents involving unauthorised access onto airfields. It is important to be able to use a video system to track an intruder, but the ultimate goal is to prevent an intrusion in the first place. IR cameras are a key component of any video security system that must provide around-the-clock monitoring capabilities. The Dallmeier line of advanced IR cameras is ideally suited for that. The IR cameras are designed specifically for applications requiring images with highest resolution in real-time at day and in IR mode at night. Dimly lit areas on the apron or sections along the airport perimeter, which might only be lit in case lighting systems are triggered by movement, are among the many possible applications. Airports typically encompass wide areas and stretch over long distances, which pose particular challenges for a video monitoring system. In the past, in order to adequately monitor the entire area, it was necessary to use a number of cameras installed in a whole range of locations. Dallmeier’s multifocal sensor system Panomera, however, represents an entirely new technology and a fundamentally different approach to the issue of video security. The patented multi-focal sensor technology is the ideal video solution for landside and airside safety and security. It was specially developed for the all-encompassing video surveillance of expansive areas. With Panomera, huge widths, as well as areas with large distances can be displayed in real time and at high frame rates of up to 30 fps. 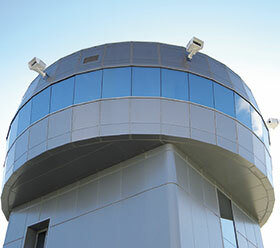 Moreover, in conjunction with intelligently designed video management and analysis systems Panomera offers unique capabilities for optimising airport operations, such as aircraft turnaround time, as well as monitoring airfield traffic on both aprons and runways (e.g. ground support equipment on the way to restocking aircraft galleys). The fact security personnel are provided with a comprehensive overview of the entire airport, regardless of where their individual focus may at any given time, means that they can react quickly to any incidents. Video technology can therefore assist airports with the implementation of the Europe-wide optimisation concept of Airport Collaborative Decision Making (A-CDM).